A friend and I occasionally talk about a fantasy ride to Alaska, but it has so far remained one of those dream rides that probably won’t happen. A ride like that would take 5 to 6 weeks, time enough to enjoy all of the sites along the way and not have to hurry. Unfortunately, not everyone can get that much time off…let alone a “hall pass” from the spouse. But one evening while reading my most recent issue of the AMA (American Motorcyclist Association) magazine I came across an article penned by a member, describing his ride along the Trans-Labrador Highway. A light went off in my head (or should that be a light went on? ), and an idea was born. Living in the mid-Atlantic region on the East Coast of the U.S. like I do means that the border with Canada is only a day-and-a-half away by motorcycle (depending on your personal comfort level). This means that we could complete the entire Trans-Labrador trip in about two weeks — a much more “do-able” time frame. A trip along the Trans-Labrador Highway, which has over 400 miles of unpaved roads, could serve as a test to see if an adventure the likes of Alaska and the infamous “Haul Road” to Prudhoe Bay is even feasible. Three years ago I sold my 2006 Yamaha FJR1300 (report) and bought a used 2002 BMW R1150 GS (report) with the idea of exploring unpaved back roads. If you read my review on the SW-Motech crash bars that I installed shortly after purchasing the GS, you know that my off-road riding skills were a bit lacking, evidenced by the marks on the left side of the crash bars and side case cover after tangling with some gravel in a turn. Since that incident I have been working on my off-road riding skills, but this has been as self-learned “OJT” (On the Job Training) and I find myself continuing to tense up when the pavement ends — not the best scenario on a big GS. In addition to some modifications to the GS (which I intend to cover in future reviews), I decided that I could use further improvements to my off-road riding skills before heading off on any Trans-Labrador Highway trip. After all, new parts fitted to the GS are not going to compensate for deficiencies in my riding skills (although they sure will look cool, right?!). Then one day while browsing the Touratech website, I happened across the BMW GS Off-Road Riding Skills Instructional DVD by Noren Films and RawHyde Adventures. Sterling Noren, founder and director of Noren Films, has produced dozens of HD (high definition) films specializing in motorcycle adventures and instructional videos. Noren and his crew have also produced films for HBO, Discovery Channel and Klim products in addition to travel documentaries and television series. 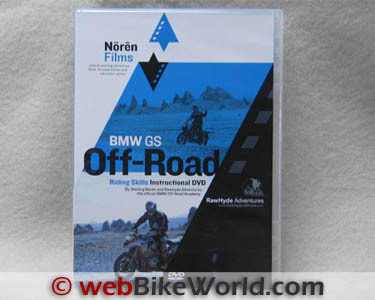 Noren and world renowned motorcycle adventurer Helge Pedersen and his company Globeriders have also created several DVDs showcasing the diverse worldwide adventures available through Globeriders, such as the GlobeRiders BMW F800GS Adventure Touring Instructional DVDpreviously reviewed on webBikeWorld. Jim Hyde is the other principal in the development of the BMW GS Off-Road Riding Skills DVD. Hyde is the owner, founder and director of RawHyde Adventures located in southern California. RawHyde started in 2002, guiding eight-day dual-sport rides from Los Angles to Las Vegas. These first tours consisted of 1,000 miles of unpaved roads, primarily through the Mojave Desert. Two years later RawHyde Adventures began their “Adventure Camp” training program which quickly became a success. Along the way, RawHyde has expanded their list of destinations to include the Baja Peninsula, Copper Canyon in Mexico and other global riding adventures. RawHyde Adventures apparently has training programs and adventure rides available to challenge the skill level of pretty much any rider. In 2008 they were officially endorsed by BMW Motorrad North America and became one of only nine BMW Off Road Academies in the world. They are also the only BMW Off Road Academy other than the BMW Performance Driving School in the U.S.A. to train owners how to handle the large and heavy BMW GS in off-road riding. I wasn’t sure about learning how to ride off-road from a DVD, but an instructional video from my daughter on basic Yoga (along with regular practice, of course), had worked wonders for my ailing back several years ago. So maybe this video would do the same for my off-road riding? Well, for $29.95, I thought “What do I have to lose?” With the present cost of fuel, that’s only slightly more that the cost to fill the tank on the GS. Of course, I wasn’t going to have the benefit of the Instructor’s feedback on what I was doing correctly (or not) and that can be very important. But I figured some guidance would be better than none. Learning from a DVD may not be the optimum scenario, but I wasn’t really in the position to attend either a RawHyde Adventure Camp or the Off Road classes at the BMW Performance Driving School, so it was all I had. Shortly after delivery, I popped in the DVD and settled back in my recliner not knowing what to expect. But what I discovered is a superbly produced video covering many basic off-road riding skills that can prove very useful. Filmed on location at the RawHyde Adventure Center, the introduction leads off with Jim Hyde discussing the common mistakes and fears made by riders who are new to off-road riding, followed by proper bike preparation and set up. This includes tips on removing those cool accessories to minimize damage in case of a fall, along with proper adjustments of the handlebars, hand controls and other parts to obtain the best ergonomics for operating a motorcycle while standing on the foot pegs. Slow speed balance and control. Front brake friction (finding the point before lock-up). Turn execution (180 degree turn). Clutch control, body positioning, balance and visually looking ahead are all stressed and reinforced throughout each drill. Interspersed through the video are short interviews with Instructors and students alike. I watched the entire video, then a day or two later I reviewed the video again, this time specifically to take notes for reference when practicing the skills at a later date. I found the BMW GS Off-Road Riding Skills Instructional DVD to be a high-quality production. Clear, concise explanations prior to each drill, together with a demonstration of the proper technique, are then followed by the students performing the exercise and the result is an informative combination. Provided you have access to an off-road area, all of these drills can be duplicated on your own, with the possible exception of riding in the hills. Get some riding buddies together and do it as a group. If you’re hesitant about riding off-road, this video is worth adding to your collection regardless of what brand of bike you ride. Of course, simply watching the DVD is not going to magically transform you into Jimmy Lewis or Marc Coma. But I do feel practicing the skills covered in the video will help me relax and feel more confident on my GS when the pavement ends and the squirrely stuff begins.